There's a card making class for everyone here, from coloring to drawing to paper crafting techniques in these fun classes in Inwood, NYC. Special words for a special person deserve . . . a special card! Sending personal holiday cards to your nearest and dearest is a way to connect with them on a deeper level. Just because you made it by hand doesn't mean it has to "look homemade!" These paper crafting classes will teach you skills to get beautiful results for keepsake-worthy cards. 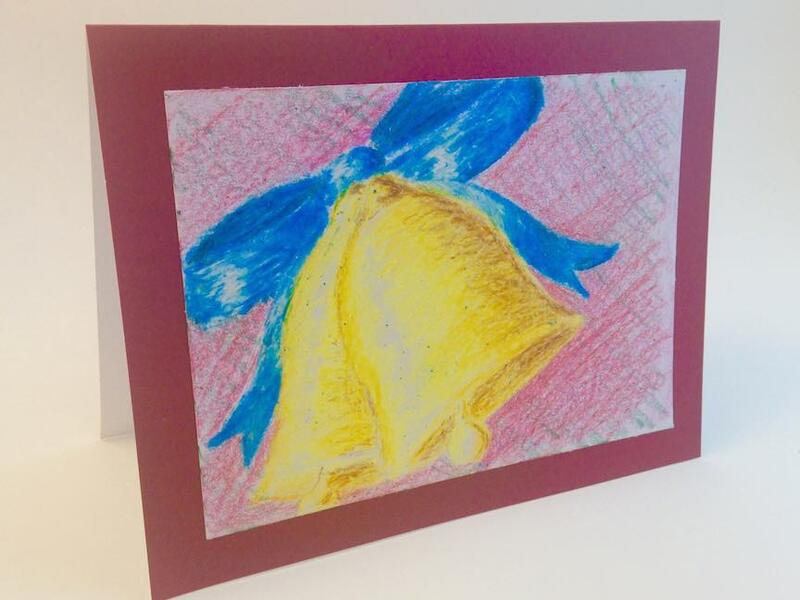 Crayons and paper are all it takes to make this beautiful hand-drawn Christmas card featuring gold bells tied with a ribbon. Everyone can color! Original candle artwork is colored with markers and layered with colorful paper to make this Christmas card. 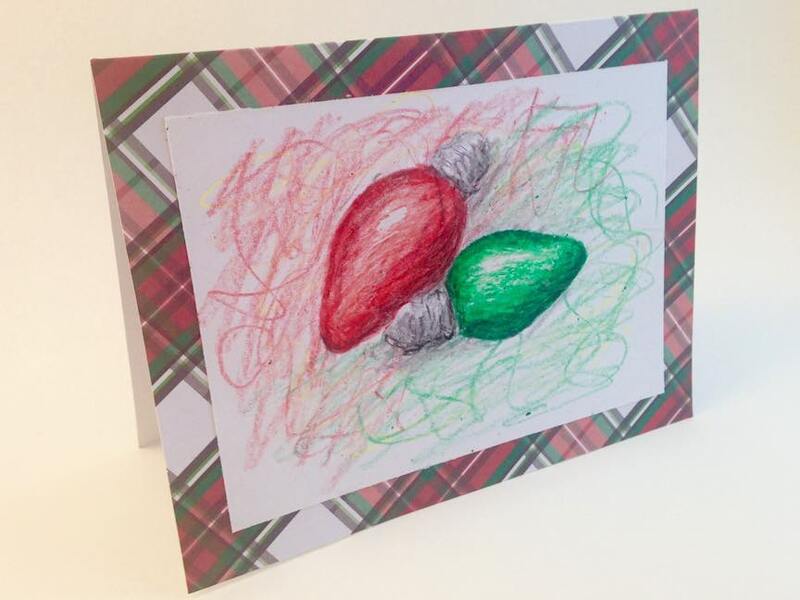 Crayons and Christmas cardstock are all it takes to make this beautiful card featuring Christmas lights. This Christmas card features a stamped background with torn and inked edges, and an overlay made with a glue stamp pad and glitter. Original holly artwork was colored with markers and layered with pretty paper to make this Christmas card. A hand-cut mitten was embellished with markers, stamps, and glitter and layered with Christmas paper to create this cozy mitten card. Using simple scrapbook cutting and layering techniques is all it takes to create this Christmas card. This heat embossed penguin was colored with markers and layered with fun papers to create this unique Christmas card. Crayons, paper, and a few simple techniques are all you need to make this beautiful pine bough Christmas card. Heat-embossing, a snowflake punch, and glittered paper combined to make a fun polar bear Christmas card. Silver heat embossing and snowflake stamps combine to make a simple, pretty Christmas card. 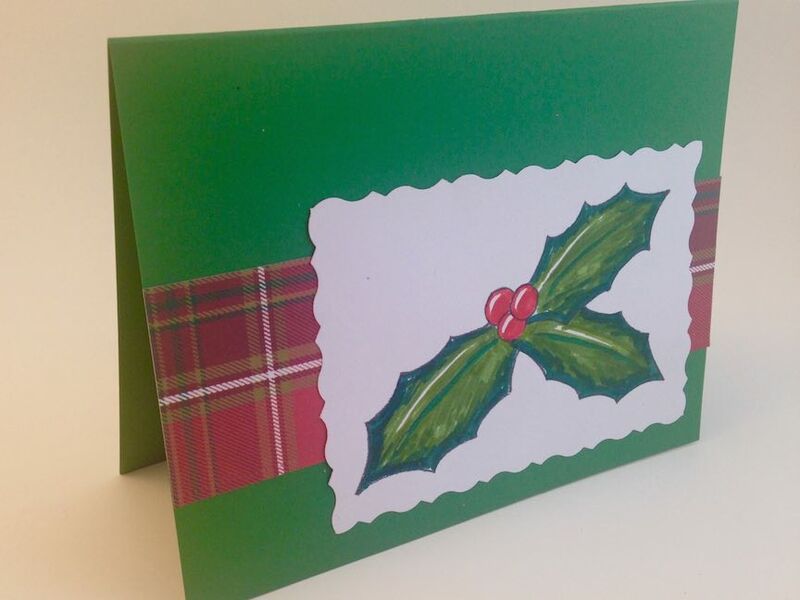 This stunning Christmas card is easy enough for children, and fun enough for adults. Markers, crayons, and cardstock are all it takes to make the stained glass effect card. Heat embossed gold stockings on a layered paper background, with a lacy punched paper ribbon make a unique and memorable Christmas card. 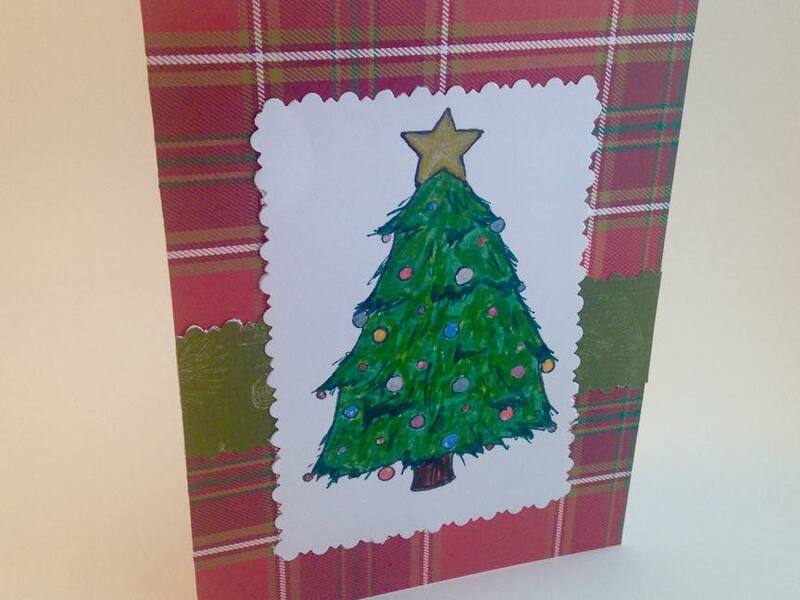 Hand-drawn Christmas tree artwork is colored and layered with pretty paper to create this fun Christmas card. A heat embossed stamped Christmas tree was cut with detail scissors and layered with pretty cut papers to create this festive Christmas card. Original penguin artwork is colored with markers and layered with pretty papers to create this fun Christmas card. Come have a cookie and some fun while making gift-worthy cards for the special people in your life. 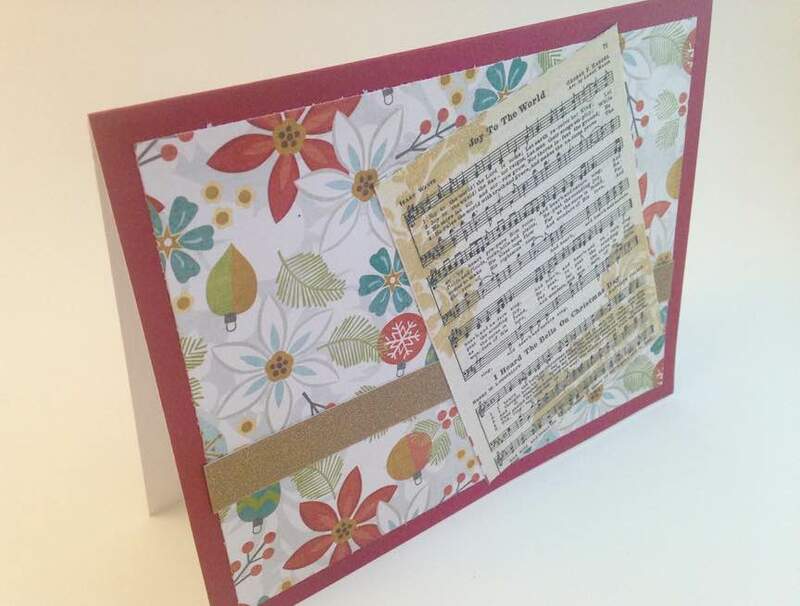 Card making classes can be reserved individually, or as a package for all day fun at a great price. Make as many cards as you like! All supplies included. Even if creating your own art sounds scary, everyone can color! At this fun class for all ages, you can cut, stamp, layer, color, and paste to create a variety of fun cards. You can even find a fun printable here if you'd like to do this activity at home. In this class, I will show you drawing techniques that can be done even with basic crayons to create beautiful results. Learn how to build colors and shading to create three dimensional effects. Class is most appropriate to older children and adults. 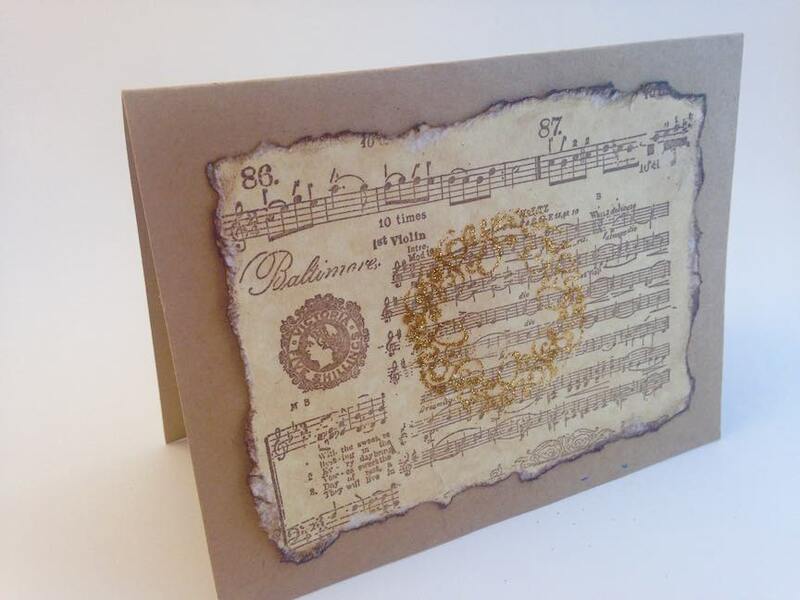 Heat embossing, glitter stamping, and punching are some of the fun techniques we will try in this papercrafting class. Suited to adults and teens (use of heat gun and sharp craft knives - children may attend, but must be under adult supervision. Save 25% for a limited time when enrolling as a pair or small group! Add coupon SHAREJOY25 at checkout when purchasing multiple tickets. 10 am - 12 pm - all ages - little ones can do it, but I'll show grown-ups some artistic coloring techniques, too! Feel free to stay between sessions to relax and enjoy a cookie! Classes will be held at my home studio on Park Terrace West, or at a nearby Inwood space depending on enrollment. Reserve online below, email, or call 212-739-9231. Drawing too scary? Everyone can color . . .
Drew it Yourself? Christmas Elf! Can you emboss? You're the boss! Stamp, color, snip, zip zip! Cards all day? What a trip! Click here for general information about all classes, including location, reservation and cancellation policies, testimonials, and frequently asked questions.